Hey, have you dug all your orphan blocks out yet? Here is another project using them. 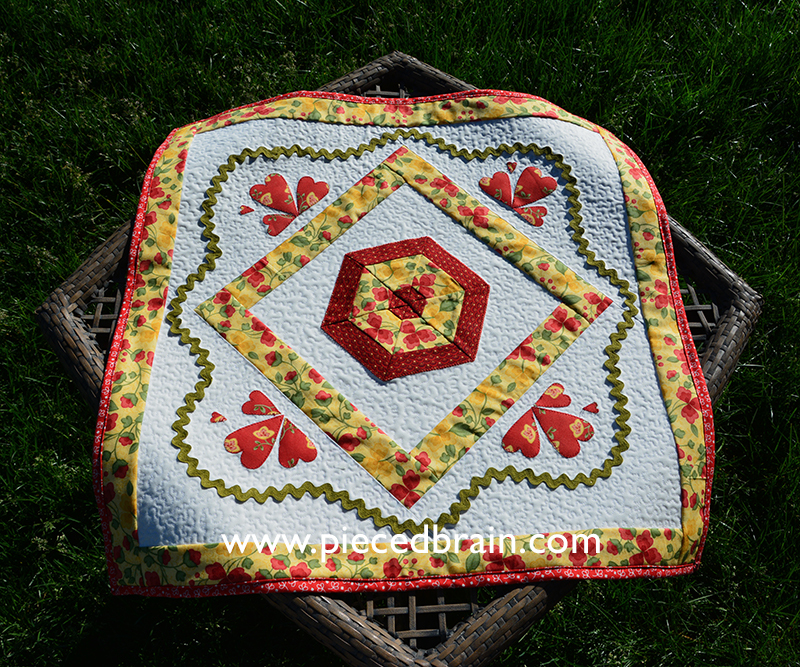 This table topper measures 23" x 23" with fabrics that I absolutely love and have had in my stash for quite a while. Now what? Well, I ironed fusible web on the back of the block, fused it to a white background and machine appliqued using blanket stitch and heavy weight thread (Aurifil 12 wt). The design came about as I went along adding a piece of this and a piece of that. 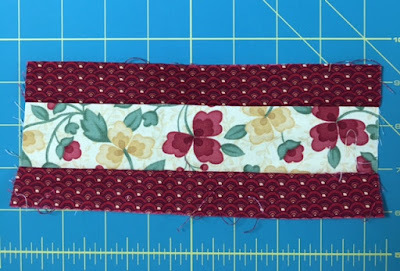 The ricrac, my go-to vine material, was stitched down with Aurifil monofilament in a zigzag pattern, from edge to edge, to keep those little scallops from bending. It works like a charm. I used a zigzag stitch to applique' the corner hearts, and tiny tiny meandering to quilt it all and and make the [unquilted] borders pop. The binding, this time, was applied by machine. 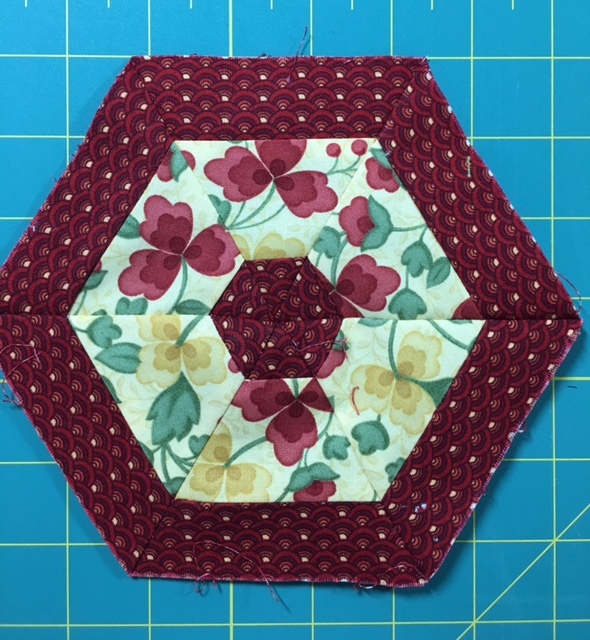 After the quilting, I trimmed the excess batting along the edges of the quilt, trimmed the backing down to 3/4", folded the backing towards the quilt and folded it again over the quilt, pinned and stitched. Easy and fast. It looks like I have another Christmas gift ready ahead of time. I am really enjoying working with orphan blocks (or orphan borders!) 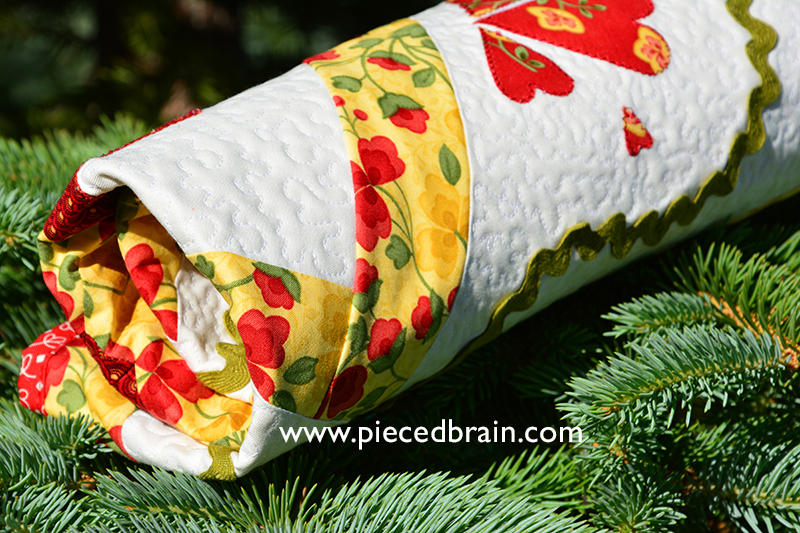 to turn them into quilted beauties. 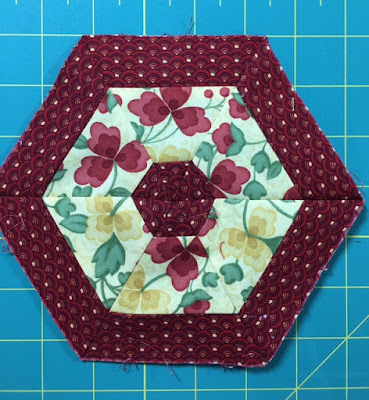 What have you made lately with those blocks and borders pieces I know you have in your stash? Send me a picture. I will link this post to Crazy Mom Quilts and Confessions of a Fabric Addict on Friday. I hope your day is filled with happy colors! I just recently started following your blog and have been impressed each time I have read a post! Today, I am especially spellbound by the beauty and specialty of how this table topper shows off each fabrics charm and how the appliques are placed so perfectly making your eyes continually go to each section and enjoy every detail! Thank you for sharing this spectacular process and the final splendor! I hope that you have a fantastic creative day! Awww... thank you! I am so glad you are enjoying the blog. I show and blog about what I really love, and hope it inspires everyone to create things of beauty! Beautiful table topper! I love the ric-rac vine. Thanks! And that is my favorite color of ricrac for vines! This is so neat! I have a whole box of orphan blocks that could be used in projects like this! What a great idea, your table topper has turned out great. I'm of the same opinion as you about using ric-rac for a vine. It always looks good, and saves all that trouble of making a real vine. Give me easy every time! What a cute table topper. 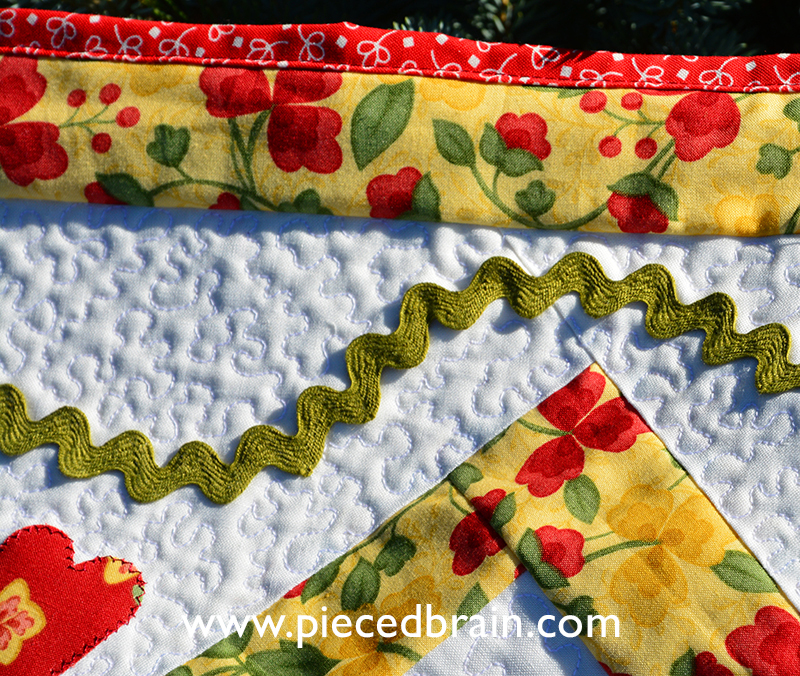 I'm amazed at how simply you just pulled that quilt together! Wish my brain worked like that! !